This document sets out how I installed GalliumOS 2.1 on a new Acer Chromebook 14" (CB3-431) 'Edgar' in April 2017. I installed GalliumOS on the internal eMMC storage, but left Chrome OS in place (allowing dual-booting). It is meant to be an easy-to-follow and particularly thorough (if repetitive) guide, but I make no warranty that it will work correctly for you. It will wipe all data on your Edgar. I have tried to provide references for each section; see the GalliumOS wiki guide to chrx installation for an overview of the general process. ⚠ Caution: There have been reports of Edgars' speakers overheating, due to a malfunction of the audio hardware, when booted into anything other than Chrome OS. I have not experienced this, and it seems to be believed that this will not now occur under GalliumOS. More information can be found in the comments for the GalliumOS Braswell Platform Validation issue. You might want to at least proceed through wifi setup and check that the hardware is working correctly. In this section you will put your Edgar into 'Developer Mode' which will 1) disable 'verified boot', allowing you to run operating systems that haven't been signed by Google, and 2) give you access to a root shell in Chrome OS. This will wipe all your data on your Edgar. See the Chrome OS generic information for entering Developer mode or How-To Geek's guide for more information. Having shutdown your Edgar, hold down the Esc and Refresh (↻) keys and press the Power key. Your Edgar will then boot into Recovery Mode and appear to warn you that "Chrome OS is missing or damaged." The screen will change to one saying “To turn OS Verification OFF, press ENTER”. Press the Enter key and your Edgar will reboot. Your Edgar will boot to a screen that says “OS verification is OFF”. If you wait, your Edgar will eventually beep several times and then boot to Chrome OS; alternatively, you can press Ctrl-D at this point to immediately boot to Chrome OS. Your Edgar will show a warning about transitioning - wait. Your Edgar will show a screen saying that it is "Preparing your system for Developer Mode". This process will take some time. A progress bar is displayed at the top of the screen. Eventually your Edgar will reboot one more time. At this point, Developer mode is enabled and OS verification has been disabled. It will continue to show the “OS verification is OFF” screen at startup. The firmware that your Edgar comes with does not properly support booting operating systems other than Chrome OS. In this section you will update the RW_LEGACY section of your Edgar's firmware and configure it to allow 'Legacy Boot'. Update: As of February 2018, Mr Chromebox has produced a UEFI Full ROM firmware for Edgars, and other Braswell Chromebooks. This is considered a better option than updating RW_LEGACY if you are no longer interested in using Chrome OS at all on your Chromebook and are using GalliumOS 2.2 or later. This guide still describes updating RW_LEGACY and allowing dual-booting with Chrome OS. This section relies on the work of Mr Chromebox. See MrChromebox.tech for more information, in particular the Firmware Utility Script section. Boot your Edgar to Chrome OS. Press the 'Browse as Guest' button toward the bottom-left corner of the screen. Hold down the Ctrl and Alt keys, and press T, to get a crosh terminal. Type shell and press the Enter key to get a regular shell in that terminal. Type (or copy-and-paste) cd; curl -LO https://mrchromebox.tech/firmware-util.sh && sudo bash firmware-util.sh and press the Enter key to download and run the Mr Chromebox Firmware Utility Script. Type 1 and press the Enter key to choose "Install/Update RW_LEGACY Firmware". Press the Enter key again to confirm the default choice of booting from internal storage. Type q and press the Enter key to quit the Firmware Utility Script. At this point, your Edgar has been configured to allow 'Legacy Boot' and the firmware has been updated to enable this to actually work. In this section you will alter the partition map on your Edgar's internal storage eMMC, so that some space is reserved for the installation of GalliumOS. This will wipe all your data on your Edgar (again). This and the following section rely on chrx. See chrx.org for more information. Type (or copy-and-paste) cd ; curl -Os https://chrx.org/go && sh go and press the Enter key to download and run chrx. Follow the instructions, including choosing the amount of disk space that you will give over to Gallium OS. I suggest leaving this at the default. Eventually chrx will prompt you to press Enter to reboot; do so. Your Edgar will enter Recovery Mode on this boot, as a result of chrx altering the partition table. Wait for the repairs to Chrome OS to complete, after which your Edgar will reboot again. At this point, your Edgar will have space reserved on its internal storage for the installation of Gallium OS. In this section you will install GalliumOS to the space that you previously reserved. This and the previous section rely on chrx. See chrx.org for more information. Before you proceed, you may wish to investigate chrx's options, in particular those relating to hostname, username, locale and timezone. Your Edgar will now boot to GalliumOS. At this point your Edgar has GalliumOS installed. To boot to it in the future, press Ctrl-L at the “OS verification is OFF” screen. To boot to Chrome OS, you can either wait at that screen or press Ctrl-D.
See How-To Geek's How to Encrypt Your Home Folder After Installing Ubuntu guide. You will have to physically open up your Edgar in this section, see the iFixit teardown of an Edgar for more information and photos. Remove the 8 shorter and 2 longer screws from the underside of your Edgar. Remove the bottom panel of your Edgar. Type 4 and press the Enter key to choose "Set Boot Options (GBB Flags)". Type 1 and press the Enter key to choose a short boot-delay and booting to GalliumOS by default. Press the Enter key again to return to the main menu. Replace the bottom panel of your Edgar. Replace the 8 shorter and 2 longer screws. ⚠ Caution: This section is both largely pointless and risks bricking your Edgar if something doesn't work as expected. It is possible to go beyond setting the GBB flags (to allow a quick boot to GalliumOS without intervention) to also changing the image briefly shown ("OS verification is OFF") when your Edgar is booted up. ⚠ Caution: Again, it's worth emphasising how silly this is and that you risk no longer being able to use your Edgar for anything by attempting it. Furthermore, the instructions are not as comprehensive or as straightforward in the section as they are in the rest of this document. 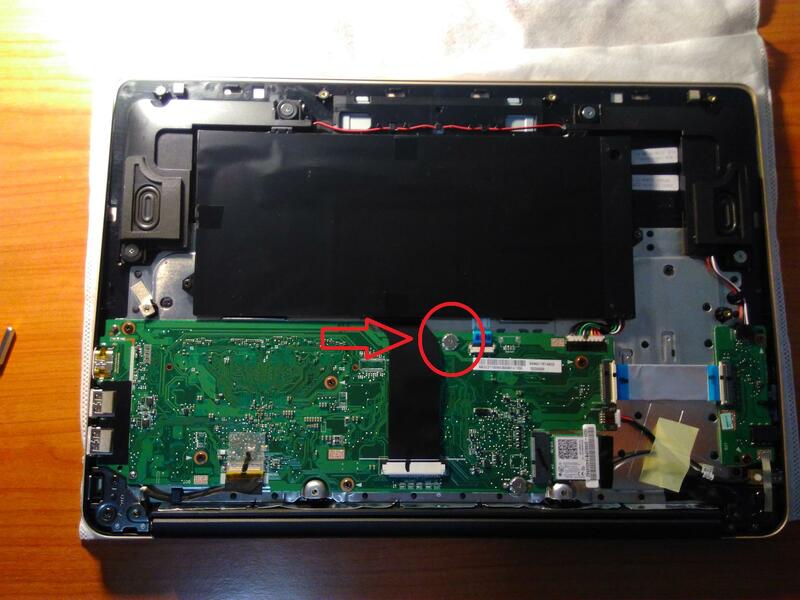 Joshua Stein describes much the same process for a Chromebook Pixel, although some of the details do differ (i.e. the boot video mode). The source code for Mr Chromebox's Firmware Utility Script and chromiumos bmpblk documentation may also be useful references. Create your new boot screen and save it as custom.png . Be aware that whatever you create will end up being scaled (and squished) down to 1024x768 (as this is the resolution that your Edgar's firmware uses when it first starts the machine). The final image has to be in a particular kind of bitmap format. The easiest way to ensure that your image is in this format is to to use Google's own script. These flags (0x4A9) specify a short boot-delay and booting to GalliumOS by default. Could you provide a tutorial on how to restore EDGAR to OEM ? Glad it worked, and I hope this tutorial was useful (despite just reproducing information elsewhere)! I'm unlikely to ever restore my EDGAR, so it's not something that I can test unfortunately. I'd guess it's a matter of resetting the GBB flags (using Mr ChromeBox's tool) if you've changed them and then a Chrome OS recovery. (I'm not sure if it's possible to rollback the firmware update in step 3, but the recovery process might do this.) Your best bet might be searching the reddit. Ah. What about switching over to the beta, or dev channels... it says it will wipe the Chromebook if I switch channels, will that affect GalliumOS in any way? What needs to be done to make the keyboard responsive? Once on the Gallium login screen no key is detected, save the touchpad.